Kitchen remodeler and home builder Homeowners Design Center has had to overcome numerous building and remodeling challenges since opening its doors back in 1969. 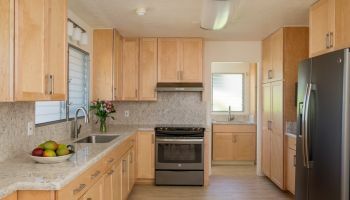 The Elder kitchen remodel located in the Kuapa Isle area in Hawaii Kai was a great example of one of those challenges. The Elders were referred to Homeowners Design Center by another homeowner who had worked with the company, meeting them at their open house nearby. Upon listening to what the Elders wanted to do with their kitchen, Jessica Omoto, Homeowners Design Center's designer on the project, recalls that it was a situation that they've run into many times. It was a case where the homeowner didn't know what to do with an over-utilized space and an under-utilized space. A kitchen remodel extending the current kitchen and combining it with the existing lanai. In helping the homeowners realize their dream kitchen, Homeowners Design Center came up with the solution of opening it up by extending it out toward the water. Doing so required joining the lanai and the current kitchen together, which meant re-enforcing a load-bearing wall that stood between the two spaces. To top off the illusion that the kitchen was sitting atop the water, they used floor-to-ceiling windows along the waterfront side of the home. 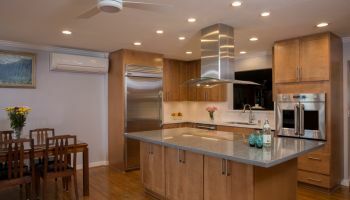 Watch the following video to see how the kitchen all came together for another happy Homeowners Design Center customer. To learn more about how Homeowners Design Center can help you with your remodeling project, click on anywhere you see their name.